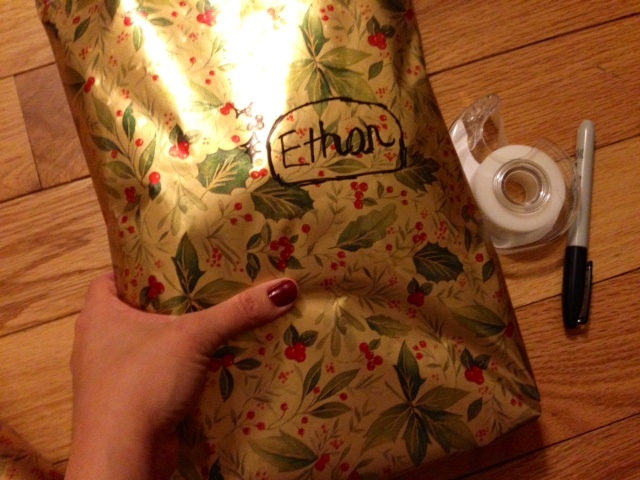 Wrapping gifts can be draining, so I thought I would share how I make the process as simple and enjoyable as possible. 1. 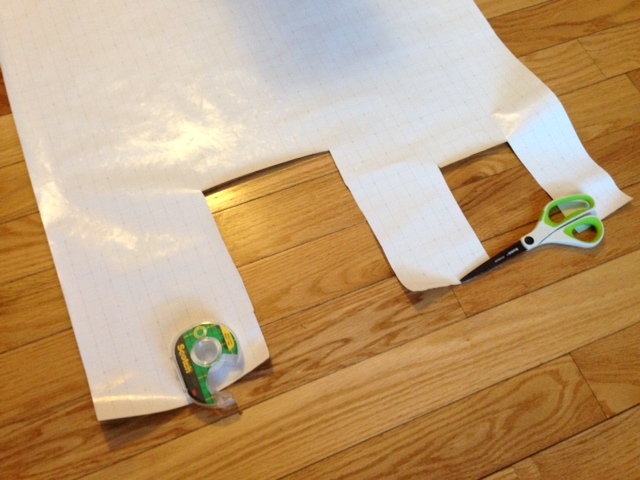 Use only one extra big roll of wrapping paper at a time. Keep using this one roll until it runs out. 2. You also need a nice fresh roll (or two) of good tape, a pair of sharp paper scissors, and a black sharpie marker. 3. When wrapping the gift, unroll the paper, place gift upon paper to measure, and always cut straight across, leaving a nice edge on the roll for the next gift. 4. If the gift is small and you need to cut away any extra paper, do so. Keep any trims in a “trim pile” to use for more small gifts. 5. Don’t be stingy with the tape. 6. No need for labels, simply write the name of your child ON the package. 7. No need for gift boxes. 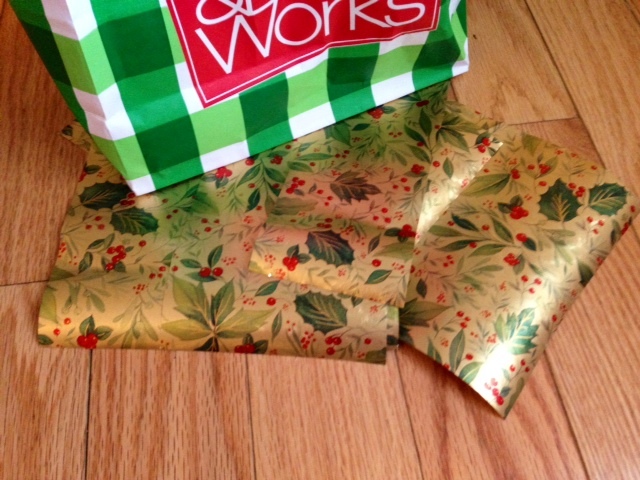 If you have clothes to wrap, just fold the item neatly and wrap it. 8. If you must embellish, buy a big bag of bows and add them to the gifts on Christmas Eve. 9. You might think that pretty gift bags with tissue paper will simplify the process, but I have found that whenever I use gift bags I can’t help getting pathological about saving them. It’s much easier to throw away paper on a Christmas morning. 10. Keep a running list on your iphone of the gifts you have wrapped. This will be important later on, when husband gets worried that a child might not have as many gifts as their sibling. (avoid last minute shopping at the gas station!). 11. After wrapping the gifts, pile them up in boxes or big bags to store away until Christmas. 12. Keep inner peace while wrapping by listening to music, keeping your cat with you, painting nails deep red a few hours before hand, eating some of the extra stocking candy, and making your husband stay out of the room so he can keep the children out of mischief. This entry was posted in it's the little things, Uncategorized and tagged christmas, howto by Shanda. Bookmark the permalink. This had me laughing out loud! Ha ha. Good tips!, I loved the picture of the paper with wrapping paper cut out. DO NOT DO THIS. Ha ha. So true!! I haven’t even started shopping yet! I think I am a tad late!! Guess what is on my to do list for today!? 🙂 Thanks for the tips!! We try to spend the same amountof money, and have the same number of gifts under the tree for each kiddo. Some years that’s pretty tricky! Don’t forget, “Lock the door!” Just in case a rascal gets away. Sometimes I get a kid standing outside the door asking what I’m wrapping and I try to think of crazy answers like, “a hippo, snow, or the Nile River.” I grew up with names handwritten on the paper, but my husband likes tags, so I make sure to get the self sticking ones. This year we are in the same amount of money but not the same amount of gifts boat because the one thing one kid wanted was so expensive. I thought about buying some cheap stuff to add just for the sheer ability to open more than 2 items. but then how much we spent just piles on. 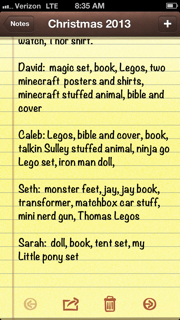 The bigger the kids get sometimes the fewer number of items because they like expensive stuff, ha! I always save a scrap piece of paper, fold it in half and write their name on the white side then tape it to the gift so I can see the name more easily. One time i had no wrapping Paper, nor tape and had a gift for my mom on her birthday… so i grabbed a towel and wrapped it around the gift then grabbed rope and tied it shut on both sides… it was cheap looking but it got the job done…. oh we also talked about how i only want a Tiny Pound of deli meat… my exact words, “A tiny pound like an ounce”…. I do really like the idea of keeping a list of what you wrapped! Thanks! We’ve had that late Christmas Eve panic of not having enough for a child…not fun! Great advice. 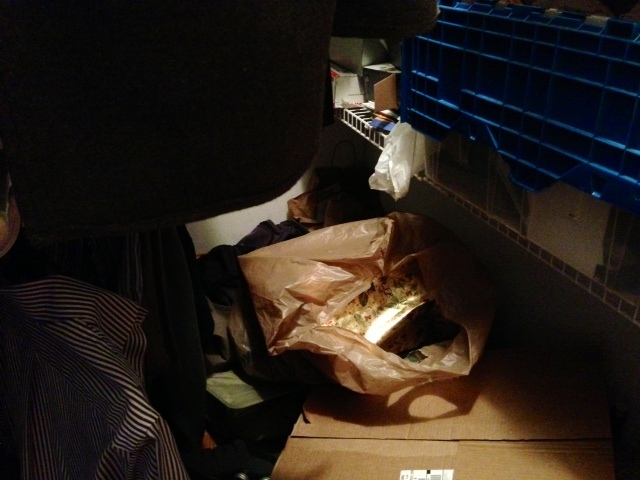 My mom would wrap things when we were gone and hide them in a closet. It was really special to come down on Christmas and suddenly see gifts! My sis Mary always has a theme each year and it is fun to see what she will do…such an artist. A lot of time she uses brown craft paper or a single color, like red,and then decorates with snowflakes or something. The list is great. Bob is wanting to be more involved than usual this year, and sometimes comes home with things for people I already have a gift(s) for. 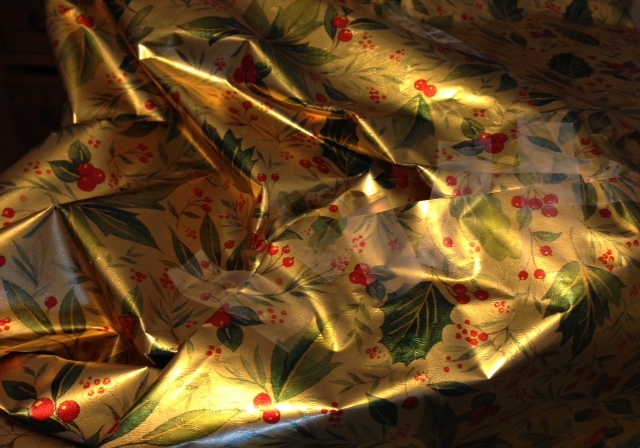 Great post—here’s another suggestion: Pay your 15 year old daughter to wrap all the gifts (except her own of course). She’s happy to earn pocket money, and I’m thrilled to not do the job this year! I finished my last gift project today!!!! Happy, Happy, Happy!!!! All wrapped and ready to go. Whew!! Shanda~ I love your ideas! So festive to share. I enjoyed your list too. My husband often wonders if everyone’s gifts are evenly distributed too. I noticed that your littles and my littles are getting some of the same things. Too cute! These are some great ideas. I never understood going to so much trouble when it’s ripped off in half a second. I especially like the idea of no boxes for the clothes…and no tags! Great tips! “Shopping at the gas station”…somehow, I can really relate to that one!😬 Hope you and your family have a blessed and special Christmas together!